So here we are, after a year of waiting and planning it’s now the eve of the big trip, this time tomorrow my plane will just be taking off as I head to LA and Everything Is Festival: The 5th Dimension! I’d been thinking about going back to the West Coast for a while now, but my original plan had been to go to the San Diego Comic-Con, but the more I thought about that I realised it just wasn’t for me, too big, too crowded and to be honest just not what I’m into now. My real change of heart though came last year, I’d been following what had been happening at Everything Is Festival since the first one a few years back, always a fascinating and unexpected line-up, and always sounding so much fun. So when they streamed it all live back in August 2013 I was hooked on watching as much as possible and that’s what made up my mind for me. That time next year I wanted to be there in person! Skip forward a year and here we are, my flight is booked, my accommodation is sorted, I have tickets for every event at the festival and best of all I’m taking part in the Found Footage Battle Royale! 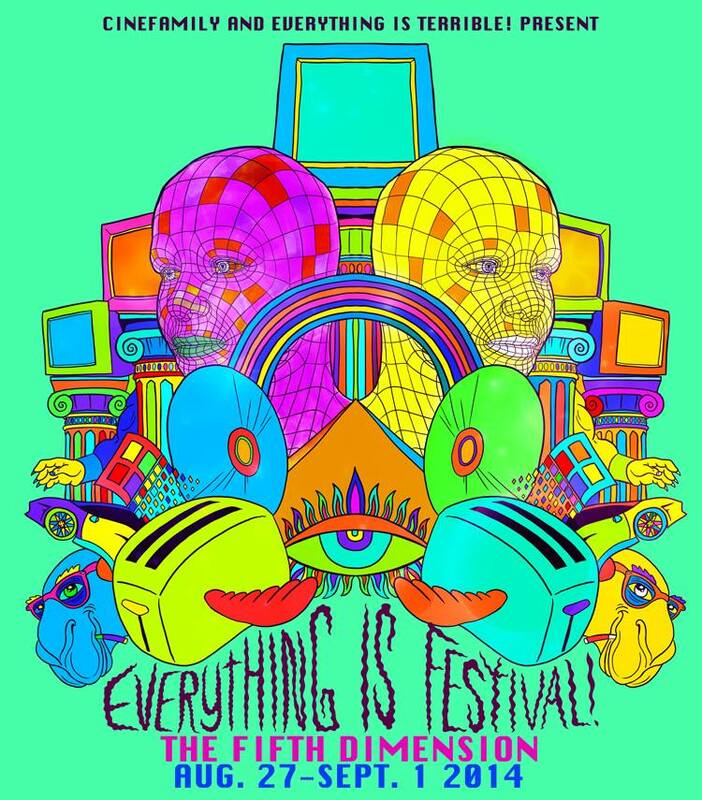 So before I head off I thought I’d run down my Top 5 events I’m looking forward to at Everything Is Festival: The 5th Dimension. Although to be honest I’m actually looking forward to everything that’s playing! Dr. Demento has been a searching for oddities in music for decades, he’s unearthed so many fascinating discoveries that this in person audience is just going to be fascinating, really can’t wait to see and hear what’s going to be unleashed at this one. The previous Everything Is Terrible mixes Comic Relief & Does The Hip Hop had the best and fastest editing I’ve ever seen on any mix tape, it was so intricately put together and such a relentless non-stop barrage of footage that I simply can’t wait to see what they’ve come up this time around. Especially as it’s all early internet based! Now this is going to be something very special, the opening event is “The Memory Hole” Art Opening, I’m not even sure what this is going to be, but Everything Is Terrible have found the motherload of vintage home video footage and have been releasing it online under the name Memory Hole. What I’ve seen so far marks a new high point in video discoveries, the stuff is so weird, I’ve no idea how they’ve turned it into an art exhibit, but I can’t wait to find out. This one is free entry, so I’ll be getting there very early to make sure I can get in. Here we go, this is the big one! 16 contestants go head-to-head in the ultimate battle of found footage and I’ll be one of the 16! I can’t wait to be there and just see what happens, will be so amazing to get onstage and introduce one of my clips. I’m not even sure how the night is going to work, I just hope that I get to show all my clips somehow, I just want to make everyone there laugh as much as possible! Who knows how I’ll do, it’ll just be so much fun to be there and take part in it! So that’s my highlights for the festival, I’m going to try and write and entry here each day about what’s been happening, though I’ll see how it goes, I’ve no idea what else I’ll be getting up to while I’m there! Wish me luck!